Campus Involvement: College Girls Rock, Inc., Students Health Promotion, Pinky Promise, NAACP, SCLC W.O.M.E.N., Inc.
What are some student-related issues you are concerned about? Fostering a stronger sense of campus pride for commuter students; making sure low-income and less fortunate Georgia State students are taken care of during campus breaks. I am running to encourage other students who are not a known face around campus to become campus leaders. Often times the students elected for positions in SGA are the same students you see involved in everything else on campus. There is nothing wrong with being actively involved on campus, but SGA needs new faces. I believe that by allowing other students to step up SGA will be an accurate representation of the diversity in leadership throughout the campus. I will attend nursing school and obtain my MSN. Once I’ve worked a few years as a nurse, I plan to do research as a Healthcare Policy Analyst. 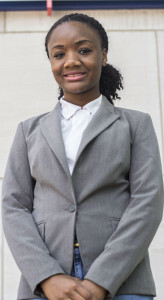 I currently work at Children’s Healthcare of Atlanta and I plan on becoming a part of their Governmental Affairs team.